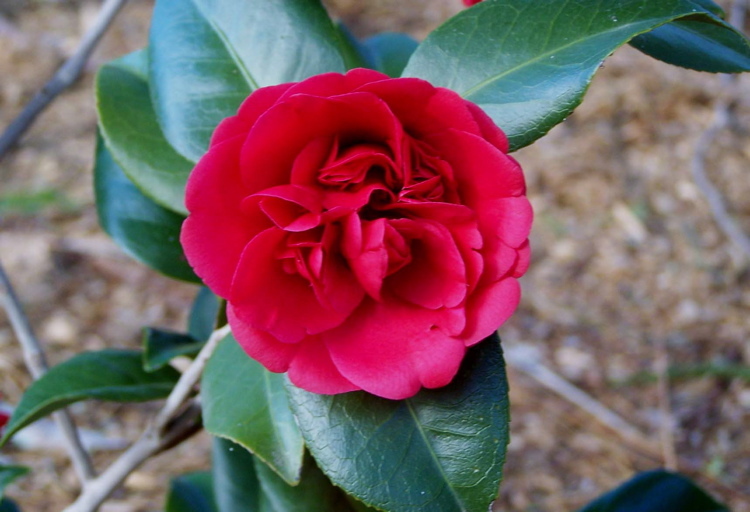 A cultivar of Camellia japonica L. Camden Park bred, seedling 12/50. ‘Scarlet crimson, petals outer two rows large and flat, inner smaller, erect and confused. Globular flower. Very handsome. Tolerably good. E.B.’ It seems probable that the basic description was by Edmund Blake with some corrections and ‘tolerably good’ added by William Macarthur. [MP A2948-6]. First described in 1850 and listed in the 1857 catalogue [T.239/1857]. It was distributed around Australia and may well have survived at Camden Park, incorrectly labelled ‘Miranda’, to the 1940s at least. [CQ]. ‘Marina’ was among the camellias positively identified at Camden Park by Walter Hazlewood in the 1930’s. He described it then as ‘rosy crimson, 2 rows of outer petals, centre a paeony, few petals marked white. [TJSC]. ‘Marina’ was listed in the ABHSR of 1849/50 and is still available today.